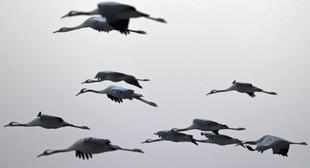 Morigaon, Nov 9 : Over 20,000 migratory birds have been sighted in the Pobitora Wildlife Sanctuary in Assam's Morigaon district with the advent of winter. Among the 214 species of avian fauna found at the sanctuary, 14 are threatened species and 46 are resident birds, officials said. The Lesser Whistling Teal and the Greater Whistling Teal have also been sighted here, they said. Birds of prey Osprey or the fish eating eagle, hawks and falcons of different species as well as endangered storks are attracted to Pobitora's aquatic environment, rich in fish and other aquatic fauna. Pobitora's authority has appealed the tourists and picnickers not to create sound pollution in the sanctuary which would harm the environment.